Indian weddings are gala affairs replete with pomp, show and colour. While there is no set dress-code as such for the guests attending Indian weddings, it helps if you turn up in Indian wear. Women can choose a wedding saree or a wedding lehenga while men can pick a kurta or a sherwani. But what kind of wedding saree to choose? How much bling is acceptable? Will a wedding lehenga be too over the top for a guest? If you have questions like these on your mind, here is a lowdown on what to wear and how to dress up for an Indian wedding that you are attending. You can wear a nice saree in silk, crepe, chiffon or georgette that has embellishments and detailing to make it dressy and festive. We’ve picked elegant and classy pieces from our collection that are perfect for a wedding guest. Take a look at them here. If your wedding lehenga is not voluminous and lavish, simply go for it by toning down the look with less make up and minimal accessories. Drape the dupatta elegantly on one shoulder and sparkle at the event with grace. When it comes to attending a wedding as a guest, an anarkali suit is the best option. It is trendy, elegant and dressy, all at once, without being overwhelming. 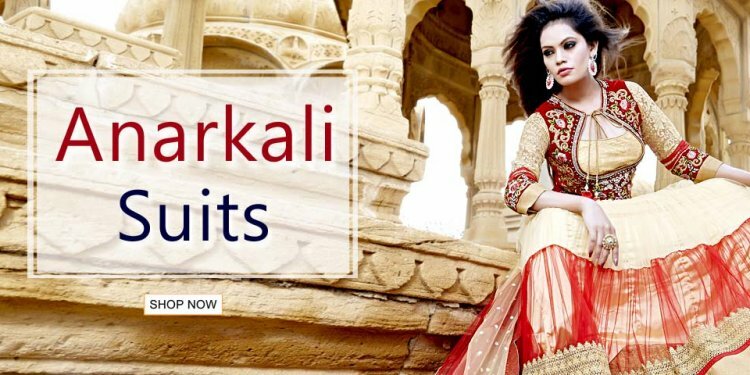 Hop over here for some gorgeous anarkalis in great styles that we have for you. Pair the outfit with a nice clutch and shiny footwear and you are all set to roll at the wedding. A well tailored kurta paired with a pyjama can never go wrong at a wedding. Keep the look stylish and comfortable. Pair the outfit with sandals, jootis or chappals. Throw in a dupatta over the kurta if you feel like jazzing up the outfit. If you are not sure what to pick, take a look at some of the wedding kurtas we have on offer here. Be it a wedding or any other festive occasion, these outfits are a great choice. If the wedding is in the family, then we suggest that you go for a sherwani rather than a kurta pyjama set. It lends a sophisticated touch to your outfit and looks regal too. Take a look at our sherwanis here and you will know what we are talking about. Pair them with a pyjama or a dhoti and celebrate the family wedding in style. Now that we have seen what your options are when it comes to outfits, here is a quick look at some of the pointers you should keep in mind while selecting the outfit for the wedding. While some women do not miss the opportunity to unwrap all their finery to show them off at a wedding ceremony, we suggest you avoid over-dressing for the occasion. That certainly does not mean that you wear a plain outfit. We would advise you to pick a wedding saree or a wedding lehenga in a subtle colour with delicate embellishments. If the blouse of your wedding saree or the dupatta of your wedding lehenga appear too lavish, trade them for pieces that are less extravagant.